Container garden designs can be as elegant or as simple as you want them to be. Choosing the right container, plants and location for your container garden adds style and curb appeal to your home. Container gardens are simply plants grown inside planters. This type of garden has always been popular, particularly among city dwellers who enjoy a cheerful pot of flowers on the balcony or stoop. The first step in creating your garden is to decide upon a design theme. Is your style more country or classic? Relaxed or formal? Many people choose container gardens to match their homes. If you plan to include container gardens in front of your home, be sure to choose a style the complements rather than clashes with your home's overall appearance. 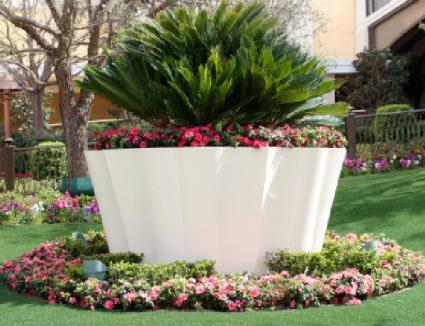 Formal or Traditional: Characterized by classic, clean lines and symmetry, a formal or traditional container garden is elegant, simple and tasteful. If you own a Colonial, Federal or Georgian style home, for example, a formal or traditional arrangement may be best suited for your container garden design. Stone urns or formal planters suit the traditional style. Informal: An informal container garden contains plants that are chosen for their beauty rather than following any rigid design guidelines, so you can choose what you like. Any type of container may be used, but terra cotta, plastic and similar styles are popular. Cottage: Cottage gardens mix annuals and perennials, and rely upon old-fashioned favorites. 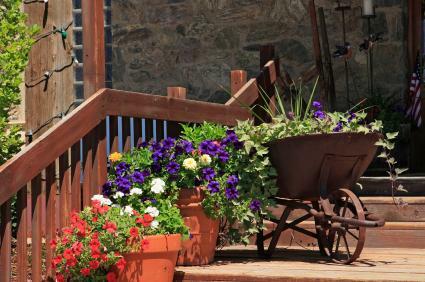 Container gardening along cottage garden themes may include old fashioned varieties and loose arrangements that compliment the overall home style and garden. 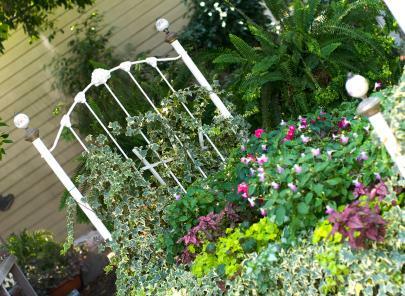 Whimsical containers, such as old wheel barrows or watering cans, go well with a cottage garden style. Window boxes are great for capturing that country cottage look. Light requirements: Some plants thrive in bright, full sunlight. Others prefer a shady location or dappled light. It's important to note how much sunlight the area for your container garden receives and to choose the appropriate plants. While you can adjust many factors such as soil and moisture, light is nearly impossible to adjust. Full sunlight is six hours or more of direct sunlight per day; partial shade or partial sun definitions vary, but usually mean morning or afternoon-only light. Growth habit: Note the height and space requirements for each flower you choose. Some plants will spill over the edges of the pot or window box, and do best when used near the edge of a container garden. Other plants like dracaenas are tall and spikey, and they look best placed near the back or center of a container garden. Annuals or perennials: Most container gardens use annuals, although perennials and shrubs, such as boxwood, rose trees and hibiscus, are also used. Annuals may be the easiest for a novice container gardener to try. Gardeners employ great creativity when they plant container gardens. You needn't spend a fortune on fancy pots or special containers. Plastic pots: Found in most home and garden centers, plastic pots have many advantages. They usually have pre-drilled holes in the bottom that allow extra water to escape. They're lightweight, easy to clean, and store well. Many are now available with decorative rims that make them look more like cast stone or terra cotta from a distance. Best of all, they're the most inexpensive option. Stone containers: Stone containers provide a regal, elegant air. From natural gray cast concrete to other types of stone, these containers add a rich look. Depending on their size, they can be very heavy, so be absolutely sure where you want them before filling them with soil; they may be impossible for you to move once they're planted with flowers. 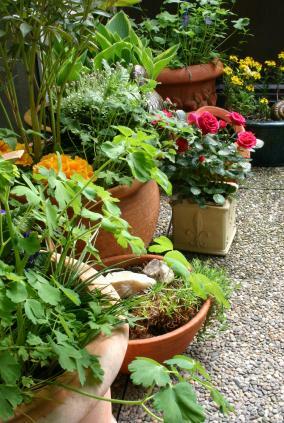 Terra cotta pots: The traditional flower pot material is terra cotta, a reddish clay. These pots add a sweet, country-style decorative touch to the garden. They are relatively inexpensive and come in many sizes. Terra cotta allows for some water evaporation, so in addition to the drainage holes, the porous nature of the pots may make the container garden dry out quicker. They also need to be taken indoors and stored out of the elements in the wintertime, or else the freezing and thawing may cause the material to shatter. Whiskey barrels: Whiskey barrels or half barrels are actually wooden barrels used to make whiskey. Once the beverage is fermented, the whiskey manufacturers sell the left over barrels to the garden center industry. Whiskey barrels are quite popular for container garden designs, especially half barrels. The barrels will retain some of the whiskey smell, but this won't harm the plants. The main drawback with using whiskey barrels as planters is that the wood will rot over time, which forces you to replace the container. Window boxes: Picture an old-fashioned window box filled with vinca vines and bacopa spilling over the sides, and crowned with shocking pink geraniums. It's an eye-catching sight. Window boxes can be mounted on any surface, and some are made with brackets to hang over a porch railing. These container gardens add wonderful charm to older homes. Watering cans: Many gardeners recycle old watering cans into decorative planters. Old metal watering cans add a whimsical touch to the garden. Drill drainage holes inside, fill with soil, and plant them up for a fun garden touch. There are hundreds more choices of planterss for container gardens. Old livestock watering troughs, recycled bathtubs and sinks, buckets, wheelbarrows; you name it, and someone has probably planted a garden in it. The key elements to consider when selecting containers for your garden is to ensure good drainage, so add holes to the bottom of any container. 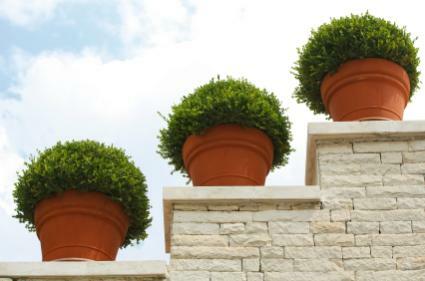 Place tall, spiky or straight-growth plants in the center of a round pot or in the middle of a window box to add height and interest. Choose draping or trailing plants for the edges. Vinca vine and bacopa both drape well over the edges of pots and window boxes. Petunias and lantana also add beautiful flowers, and some cascade over the edges of the pot. Don't overcrowd the plants. Follow recommendations for spacing. Remember, as plants grow they will fill in the pot. Select annuals for both flower color and foliage color. Coleus, with its variegated bronze and green foliage, adds great color and interest. Begonias also have lovely bronze colored foliage or light green foliage and small but vibrant flowers. Combining these plants with other annuals creates vivid and colorful home container gardens. Play colors from opposite ends of the color spectrum off one another. Green is considered a neutral when designing gardens. Blue and pink flowers contrast nicely, as do vibrant yellow and dark blue or purple flowers. You can also design a container garden all around one color, selecting themes and variations on common flower colors such as red, pink, yellow or blue. Some flowers attract hummingbirds and butterflies. If you enjoy watching nature up close, adding pots of geraniums or window boxes full of lantana, geraniums and zinnias near a window or outdoor seating area provides quite the show as birds and butterflies visit throughout the summer. There are as many variations on container gardens as there are gardeners. For some ideas to spark your creativity, visit the following websites. Garden Ideas: From window boxes to porch planters, Garden Ideas provides detailed plans, instructions and suggestions for you to create the perfect container garden to complement any décor. Gardening Guides: A treasure trove of ideas and resources, Gardening Guides helps novice and experienced gardeners alike create their dream container gardens. Container Garden Design: This is a complete website devoted to container garden designs, covering plan selection, container selection, design tips and more. Whether you have a little space or a lot, container gardening provides even the biggest brown thumbs with the chance to play in the dirt. Find a pot, grab some soil, buy a six pack of annuals, and create your very own container garden!